There is coverage if a tree falls and hits your property. The tree needs to your house or other insured structures, such as a detached garage, shed or fence. Michigan homeowners insurance policies provide coverage for the damage the tree does to your property and the contents inside it. This includes trees felled by wind, lightning or hail. You do now have to own the tree for there to be coverage. 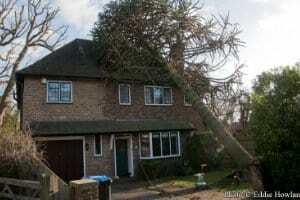 Trees felled by wind or lightning damage are also covered as long as there is damage to your property. Michigan insurance companies do not investigate where a tree originally came from because in cases of hurricanes and strong winds, trees and branches can be uprooted from far away distances. In some cases, if the tree is located on a neighbor’s property, the Michigan insurance company may try to collect from the neighbor’s insurance company in a process called subrogation. Usually, this will happen if the tree was in poor health or not properly maintained. When the Michigan insurance company collects from the other insurance company, you will be reimbursed for your deductible. When will Michigan Insurance cover the removal of trees? If a tree hits an insured structure, such as your house or garage, there is also coverage for the cost of removing the tree, generally up to about $500 to $1,000, depending on the insurer and the type of policy purchased. If the fallen tree did not hit an insured structure, there is generally no coverage for debris removal. However, if a tree falls due to neglect or poor maintenance, you may not receive any coverage. Standard home insurance policies also provide coverage for damage to trees and shrubs due to fire, lightning, explosion, theft, and vehicles not owned by the resident. Insurers will limit the coverage to about $500 for any one tree, shrub or plant. Trees and plants grown for business purposes require a separate business insurance policy and will be excluded under your Michigan homeowners coverage. Michigan Homeowners insurance usually will not cover the removal costs of fallen trees if there is no damage to any insured structures, in these situations you will be responsible for the costs of tree removal. Check with your local city or municipality to determine who is responsible for a tree that falls into the street. If your city takes responsibility they may remove the portion that’s in the street. Any of the felled tree that’s left on your property may be your responsibility. Michigan car insurance is responsible for damage to your vehicle from fallen trees. Car insurance and not your homeowner’s insurance that will cover the cost of repairs if a tree hits your car. But, the tree doesn’t have to be from your property. You likely have coverage if a tree falls on your car, no matter from where. Your Michigan car policy may also cover the cost to remove the tree from atop your car. You will need to have comprehensive coverage on your Michigan car policy for there to be coverage. For more questions on what may be covered under your Michigan auto policy read the post Understanding Michigan Auto Insurance. To get Michigan Homeowners coverage, you can contact a Michigan Homeowners Agent to discuss what may be covered under a Michigan homeowners policy.